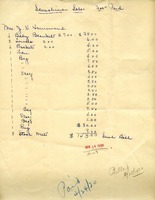 Mrs. Brixey ordered 2 cabin towels and 1 blue blanket which were sent on May 29, 1930. 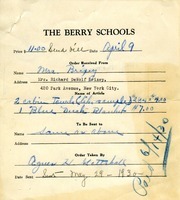 Rachel McClenahan thanks Martha Berry for the gift of four towels made at the Berry schools and expresses her desire to visit during her motor trip through the South. Letter notes order was completed and shipped to Mrs Curtiss and a request to learn if Mrs. Rivers, Atlanta still wanted an earlier- ordered dogwood quilt and reply on reverse side from Mrs. Inman confirming order for the quilt. 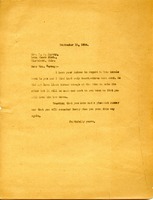 A letter from Martha Berry to P.V. 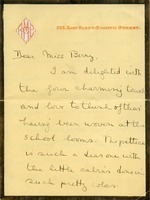 Harvey apologizing for the number of towels sent to her. She explains that she did not have enough linen thread at the time to make the other dozen but the rest will be arriving soon.